Proteins move. Most people are likely familiar with proteins in the context of their own nutrition – you get protein from meat, unless you’re a vegetarian, in which case you might get protein from soy or milk. But proteins are not just a part of your diet. The extremely broad category of molecules contained under the word “proteins” varies wildly in terms of size, shape, and composition, and their activity in your cells determines your health and survival. Proteins – large molecules that are the workhorses of living cells – facilitate many important functions through their interactions with other proteins, DNA, and small molecules, such as drugs. It has been fifty years since the first protein structure was determined, and the insight gained from studying these structures should not be understated. A major theme of biochemistry is the “structure-function paradigm” which says that a protein’s structure will dictate its function. Textbooks are graced with colorful images of protein structures, making it easy to think of protein molecules as trapped in a single configuration. But in a living cell, proteins are quite mobile and dynamic molecular machines. A well-known animated video from a collaboration between XVIVO, a studio which specializes in scientific animations, and Harvard University (watch it here) illustrates the dynamic nature of proteins in a cell. For example, at 1:19 in the video, the famous example of a motor protein is depicted “walking” along a microtubule. This motion has been programmed into the function of the motor protein by molecular evolution, another area of intense study. The motions in the aforementioned video are slow-motion representations of the actual protein movements, which mainly occur on the millisecond-to-microsecond (10-3-10-6 seconds) timescale in a cell, based on data collected by the available methods in 2006. However, there are movements in proteins which occur much more quickly than could be readily analyzed ten years ago. Specifically, rotations and fluctuations of protein side chains occur on the picosecond (10-12 seconds) timescale, and many conventional techniques struggle to accurately capture these motions. Fortunately, much progress has been made over the past ten years in studies of functional protein motion, allowing us to examine protein dynamics at these faster timescales. The development of new spectroscopic techniques (methods which gain information by manipulating the interactions of light with parts of the protein) has been particularly enlightening in this field of research. At Indiana University, the Thielges lab uses ultrafast infrared laser technology (a technique specifically known as 2D IR spectroscopy) to focus on very fast protein motions, which underlie the slower movements observed by more traditional techniques. An infrared ‘probe’ – a small alteration in the protein structure, typically changing only one or two atoms – facilitates the use of infrared light to quantitatively measure fast dynamics in the environment surrounding the probe. These ‘fast dynamics’ refer to changes in the protein that occur on the order of picoseconds, the previously mentioned timescale which is difficult to assess with conventional techniques. 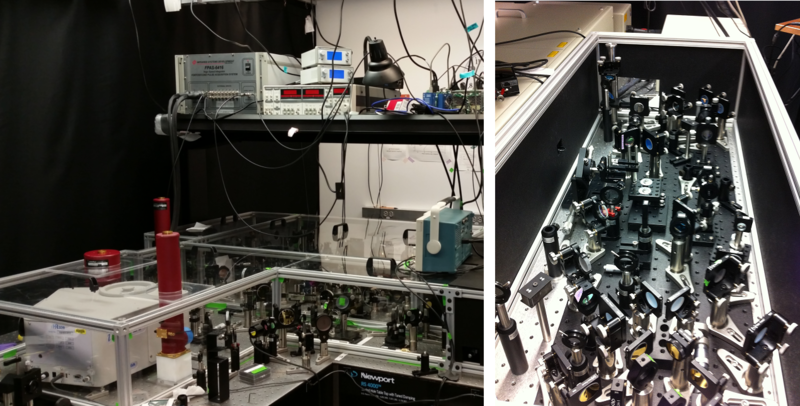 Left: the laser system used to study protein dynamics in the Thielges lab is built from many lenses, mirrors, and other optics. The red cylinders house the detectors for the 2D IR experiment. Right: the inside of a section of the laser system which generates the infrared light. Work in the Thielges lab has shown that these fast dynamics are important to protein function. For example, cytochrome P450s are a major family of enzymes (a type of protein) involved in the metabolism of drug molecules in humans, although P450s have other functions as well. One P450, specifically ‘P450cam,’ was found to have distinctly different dynamics in its interactions with different small molecules. The function of P450cam is to interact with one small molecule, camphor, and aid a chemical reaction at a specific location, but the picosecond-timescale dynamics in P450cam were faster when the protein was bound to slightly different small molecules which it acts on at multiple locations (a detailed report of the study can be found here). When extended to other P450s, this study will provide information on the role of dynamics in drug metabolism and the complexities of interactions between competing drug molecules which cause complications in current therapies. While it’s crucial to understand how proteins move, this is not to say that protein structures are unimportant. Indeed, much has been learned and can still be learned about protein function from structural studies. However, in many cases the structure provides a starting point from which many more complex questions arise. So whether you’re confronted with a static image of a protein in a biochemistry course, or just enjoying your last grilled burgers of the summer to fill the required protein quota in your diet, remember that proteins move. Edited by Maria Tiongco and Noah Zarr.